You know that coffee-stained vintage t-shirt that you just can’t bare to part with even though it’s completely unwearable? Give it a new life as an adorable, practical produce bag. 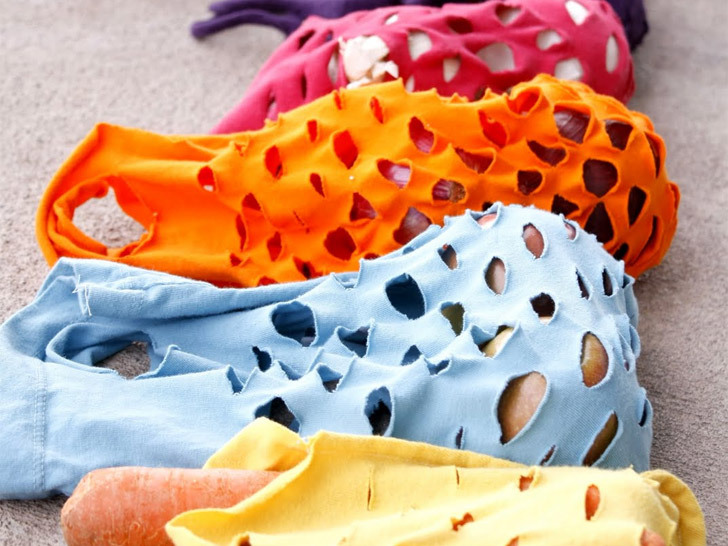 Delia Randall of Delia Creates has the perfect way to recycle your old tees into useful accessories with just a few simple cuts and stitches. Not only do the eco-bags not create waste, but you get to enjoy your favorite t-shirt for many more years to come! Hit the jump for a step-by-step tutorial. You know that coffee-stained vintage t-shirt that you just can't bare to part with even though it's completely unwearable? Give it a new life as an adorable, practical produce bag. Delia Randall of Delia Creates has the perfect way to recycle your old tees into useful accessories with just a few simple cuts and stitches. Not only do the eco-bags not create waste, but you get to enjoy your favorite t-shirt for many more years to come! Hit the jump for a step-by-step tutorial.